In a previous post The Best Lenses for Night Photography I highly recommended Rokinon lenses due to their lack of coma and low price. 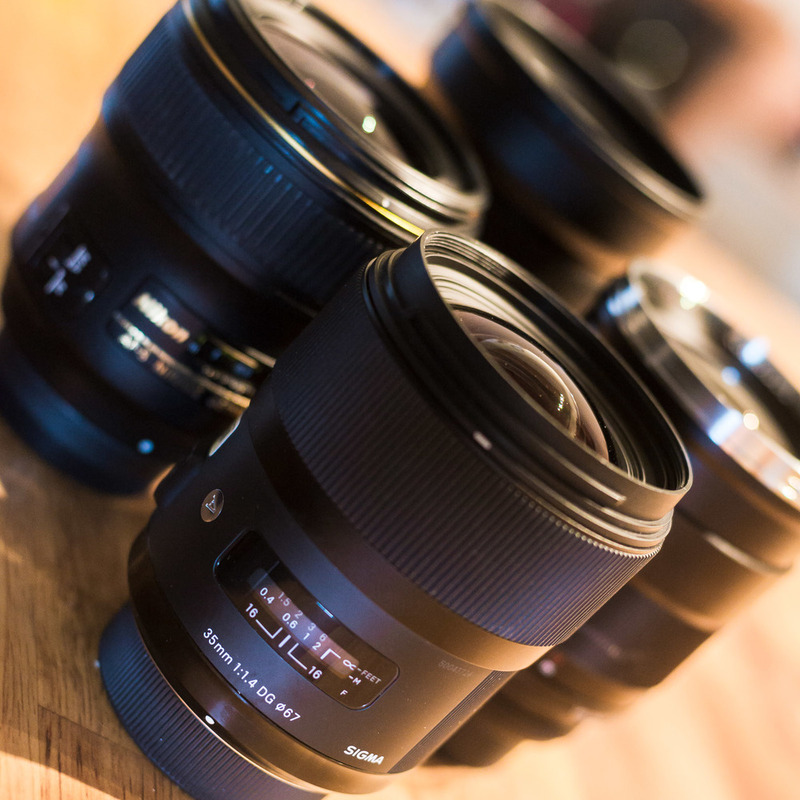 With the recent release of the Sigma 35mm f/1.4 lens I felt it was time to put all the fast 35mm lenses head to head and see which rises to the top. This test wouldn’t be possible if it were not for my friends at BorrowLenses. I highly recommend renting gear to do your own tests! Keep in mind that this test is for a specific style of night photography to capture the stars as points of light. This requires wide open apertures and high ISO’s. You can see more of my style of night photography in my Nightscapes gallery. In this lineup I was surprised to find that all of them performed very well! With the 14mm and 24mm lenses the Rokinon’s blow away the Nikon/Canon equivalents. At 35mm though, it’s a different story. The Nikon actually performed the best, followed by the Sigma. The Zeiss performed the worst and the Rokinon in between. None of them performed poorly in this area though like the Nikon/Canon 24mm f/1.4, so I wouldn’t base your decision on this alone. Click on any of the images in this article to view full size. I was surprised by the lack of sharpness of the Zeiss in the center of the frame, oddly it’s sharper on the edges than the center, based on this alone I can’t recommend the Zeiss for night photography. Overall the Sigma had the best sharpness, followed closely by the Rokinon. Not a big difference in this area that I could, I didn’t shoot a white wall so this test is not very accurate or significant. I could obviously see that the Rokinon performed better than the rest though. CA in night photography shows up as glowing edges around the brightest stars. This is where the Sigma really shined, having almost no CA whatsoever. The Rokinon did not fare well in this test, you can really see the bloom around the bright stars. Another category where I feel the Sigma blew the rest out of the water. The Sigma has less green haze than the rest, and has more purples coming out of the milky way that I would expect to see based on my experience. The Nikon performed well and the Zeiss and Rokinon were not impressive, having a yellow/brown haze. The only negative I can give the Sigma is the fact that it doesn’t seem to be a true 35mm, it appears to be around 32mm compared to the others. I’m not sure how to verify this, but when you overlay the images it is obvious. The Rokinon is quite a bit lighter than the rest, something to consider if you’re hiking to remote locations to do night photography. I do not use autofocus at night so I did not factor this into the final score, but I wanted to note that the Sigma and Nikon have AF while the Rokinon and Zeiss do not. The AF on the Sigma is the quietest I have ever heard, very nice. The new Sigma 35mm f/1.4 is the clear winner, it creates the most appealing images out of the group and the price is reasonable compared to the Zeiss or Nikon. If I only had $900 to spend would I get the Sigma? Probably not, I would get the Rokinon 35mm and the Rokinon 14mm and still have money to spare. So what did I do? I sold my Rokinon and got a Sigma, I do this for a living so having the highest quality lens is important to me. Good tests, I’d just like to point out that the center of the Milky Way is in fact mostly yellow and brown, not purple. The only lens here that seemed to produce accurate star colors was the Nikon, followed closely by the Rokinon, then Sigma, then Zeiss, which were consistently too purple or too blue. Also, were these all shot wide open? You should repeat the tests at f/2.0 and f/2.8. They would all likely perform significantly better. I use my Rokinon at f/2.8 and it is hard to find a fault with it.